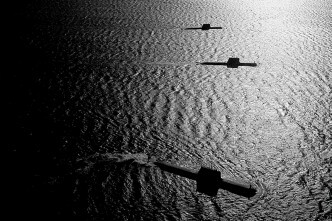 The new White Paper was accompanied by the release of the DMO’s Future Submarine Industry Skills Plan—a substantial piece of work in its own right that deserves (and will get) a much deeper analysis on The Strategist than is possible today. But it’s a very welcome development. At least at first glance, this discussion paper puts into the public domain far more information about the problems of managing the nation’s shipbuilding workforce than has previously been the case. ASPI has a long-standing interest in shipbuilding, and previous Strategist posts have looked at the difficulties faced by the government and shipbuilders in managing the shipyard workforce through the ‘valley of death’ that will occur when work on the air warfare destroyers winds down and before the future submarine and/or future frigates come along. A much rumoured possibility was the announcement of a fourth air warfare destroyer to help bridge the gap. I thought it unlikely that there was a cost-benefit case for that, so I give the government a tick for resisting the lobbying that went on for such an announcement. But the workforce problem is real enough. Or, more accurately, if we insist on building ships in Australia so we can keep on building ships in Australia, we’ll need the people to do it. At the moment there’s about 3,000 people employed in shipyards on government contracts. On current plans for building naval ships, we’ll need twice that number in 2027. The trouble is that we’ll need next to no one in 2017. The figure below, taken from the new DMO report, shows the problem. There were a few announcements made today that impact on the projected workforce requirement. 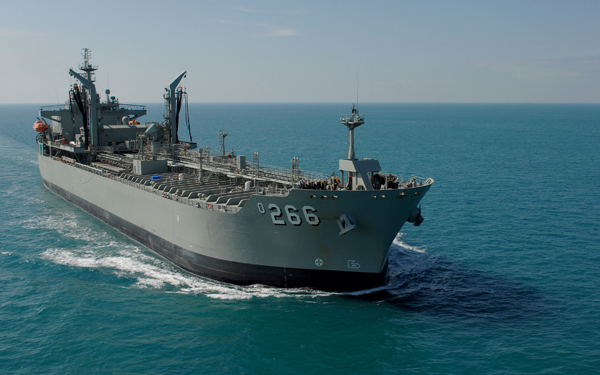 In summary, the navy’s at-sea replenishment vessels will both be replaced as a matter of urgency, the replacement for the Armidale class and Pacific patrol boats will move forward (an unspecified amount), as might the future frigate program. 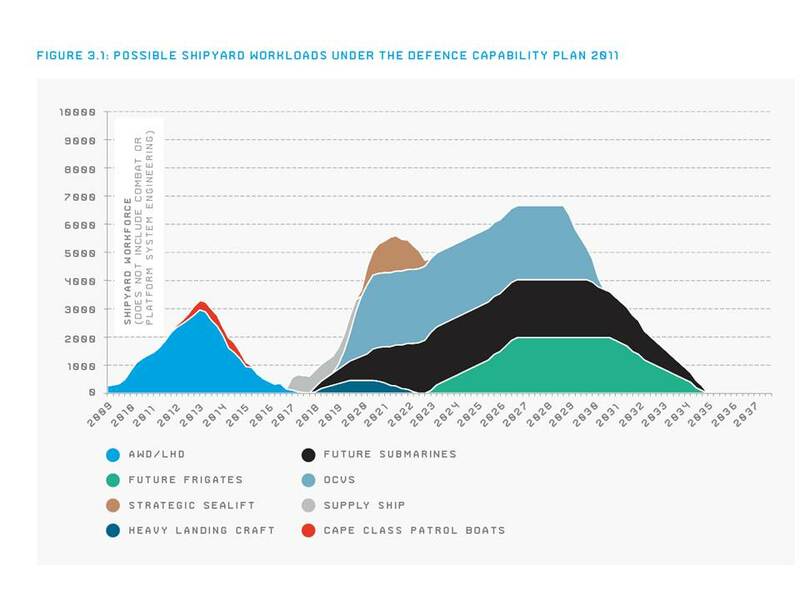 The 2,000 ton multi-role offshore combatants announced in the 2009 White Paper are now just a twinkle in the eye, as a ‘possible future project, subject to technical maturity’. Less obviously sensible is the possible move of bringing the future frigates forward. I’ll reserve judgement until more detail is available, but we’ve just spent a lot of time, effort and money upgrading both the Perry class FFGs and the Anzacs. In fact, we’ve only really just started work on the Anzac fleet, having taken years finding the right solution. I argued that a fourth air warfare destroyer might be a case of the ‘industry tail wagging the capability dog’. I hope that isn’t the case here.